SKU: 1058 Categories: Uncategorized, Want to become a distributor? (1) CEO Training Materials See individual products for details. Purchase of this product will generate an autoship with the RicoLife Weight Control System containing popular Purple Tea products that help support a healthy metabolism and weight loss. 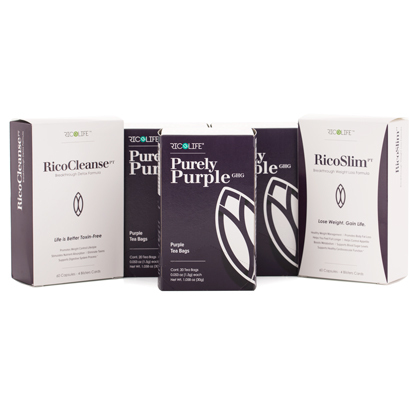 Includes: (1) RicoLife Cleanse – 60 capsules, (1) RicoLife Slim – 60 capsules, (3) Purely Purple GHG – 20 tea bags each. See individual products for details. Wholesale – $163.00, 137 BV, and 163 QV.